Quick Catch has received recommendations and testimonials from many of our clients. We appreciate being able to help them. “If you’ve ever dealt with the feeling of ever being violated, it’s an even deeper level of frustration when you can’t prosecute the perpetrator because it is classified as “ something that is a nature’s process” or something that “comes with the territory”. Personally for us, that was a bunch of HOG WASH…literally speaking!! To return from a restful weeklong vacation last summer to find 85% of our entire beautifully landscaped back yard to be demolished by hogs, equating to over $10,000 worth of property damage, isn’t nature…it’s war!!! To our family and neighbors, the usual “cute” and random deer, furry rabbits, wild turkey, or armadillo visits were welcomed with not much worry. But after 6 months of dealing with and being the single target of a sounder of approximately 5 hogs, we were tired of seeking the assistance of three different trapping companies, using four different traps, mid-night stake outs, promises of the job being completed, and creative repellants to deter the problem.Low and behold the problem EVIDENTLY still existed. It was the evident threat of them moving closer to the pool’s screen enclosure and our family was a chance our family wasn’t willing to take. 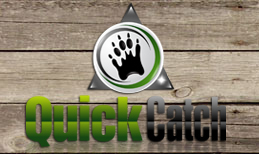 Finally, thanks to Quick Catch were we able to finally regain peace of mind, as we recall the night of finally catching and doing away with a close to 400lb wild boar. Just wanted to send you this e-mail and tell you how much I appreciated your getting rid of my many critters (skunks, possums, raccoons and many, many moles). What really impressed me was the way you handled everything. I was reluctant when I hired you because of my 2 dogs and 2 cats that run around my property. You worked extremely well with my pets. Also, I was relieved to know that you were not harming the animals you took away, and that they would be living somewhere new and making new friends that would welcome them. Thank you so much. Responded quickly to calls and had traps in place within hours. Knew the best way to position and bait traps for a high percentage of catches. Quickly removed captured animals so they didn’t spend much time in traps on our property. Released animals in a safe, remote location – a better place for them to be. Charged a very reasonable price for the work done. We were entirely satisfied with the service provided and would recommend Quick Catch to anyone who needs wild animals removed from their property. Thank you, Ryan for being dependable and for providing excellent service. There is no doubt in my mind that I will confidently recommend you to anyone who needs your service. You are a true professional with an impressive knowledge of wildlife. I look forward to sending you more business! I could not have been happier with the services your company provided to us in April. This happiness is mainly due to the assistance your technician Chris provided. Chris had to come by our house a few times and each time, I really feel that he went above and beyond the services required of him. He was very knowledgeable! My daughter and I learned a lot about invasive species and lots of other animals. But more importantly, he really put my mind (and heart) at ease about the raccoons he had to relocate. I would highly recommend Quick Catch to others, and that is because of Chris. Our passion for impeccable customer satisfaction along with our love for animals and appreciation for the natural part of our world is the driving force of Quick Catch.